How long did Galileo operate? 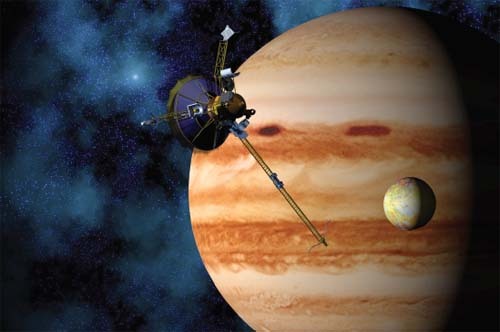 Galileo successfully achieved Jovian orbit on December 7, 1995. Unfortunately, its high-gain antenna had failed, so astronomers had to receive data from a much weaker backup antenna. Working creatively, scientists were able to increase the communication speed by nearly ten-fold; but even at its best, the transmission rate was still only one percent the speed of a dial-up modem here on Earth. Galileo outlasted even optimistic estimates of its lifetime. After its primary science mission ended two years after orbital insertion, the spacecraft continued its extended mission for more than five years afterward. Galileo’s cameras finally succumbed to radiation damage, and were shut off on December 17, 2002. The spacecraft continued to send valuable scientific data until the end of its mission, sending a total of about fourteen thousand images and thirty gigabytes of data back to Earth. In all, Galileo orbited Jupiter thirty-four times and traveled a total of 2.9 billion miles (4.6 billion kilometers). The Galileo is depicted approaching Jupiter in this artist’s rendition.